I wanted to share a math lesson that I started with my class on Friday and you may be able to use this month. If you have read some of my other posts you know that there is a focus in our area on inquiry based math lessons, getting students to talk to each other about their thinking, having students teach each other and working towards consensus to build understanding. On Friday I introduced our Halloween craft. It is based on this picture and post I found on Pinterest. I have made these with a class before. 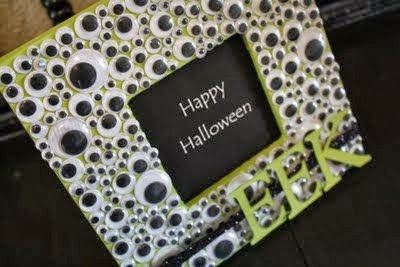 I use wooden picture frames from the dollar store, Halloween coloured paint and googly eyes galore. Since I have been teaching some of these kiddos for three years they have made a frame but will be making a second one and they are excited! Here is what I told my students we need to figure out. How many packages of googly eyes do I need to buy? I asked my students what do we need to know to figure this out. I recorded their questions. Then I answered the questions that I could. First question was mine the rest are the questions that they thought we needed to solve before they could answer mine. I brought in a sample frame from my daughter's room. (I made photocopies of the frame for them to work with but didn't pull those out yet!). I brought in many different packages of googly eyes. 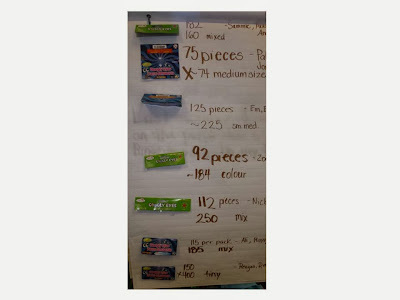 We looked at each package and recorded the amounts. Then they did not know how to move forward. 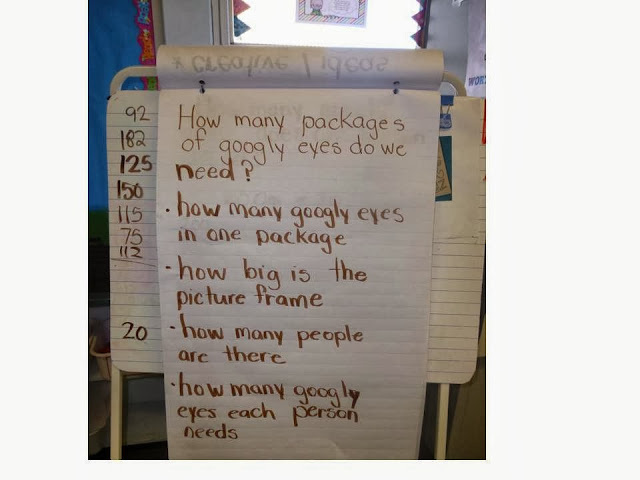 Through some discussion they understood they needed to know how many googly eyes per person. They thought they would just guess by looking at the packages or saying 1 pack per person or 2 people split a pack (some were concerned with the cost and did not want to say too many!). I told my class I did not just want to guess and end up back at the dollar store for more googly eyes. I wanted a really good idea. Finally a few students decided we could cover the frame with googly eyes but not glue them down to figure out how many we need. 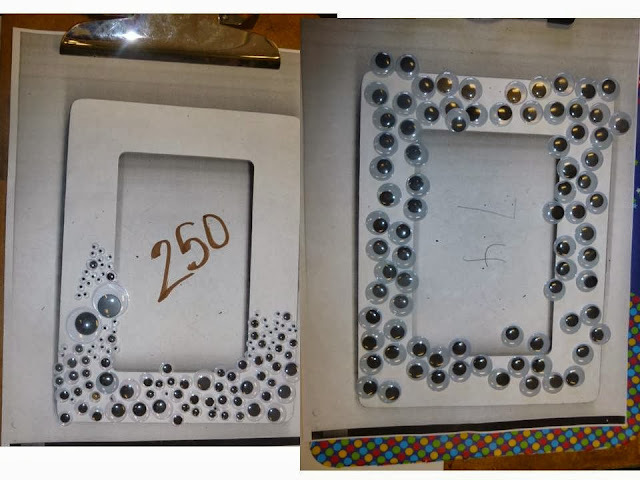 I took out the photocopies, gave each group 1 package of googly eyes and sent them off to figure out how many googly eyes we need to cover the frame. 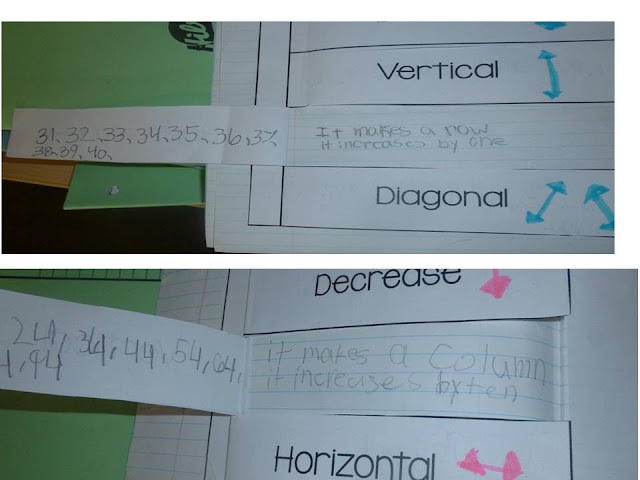 Since there were different sizes groups had different answers. 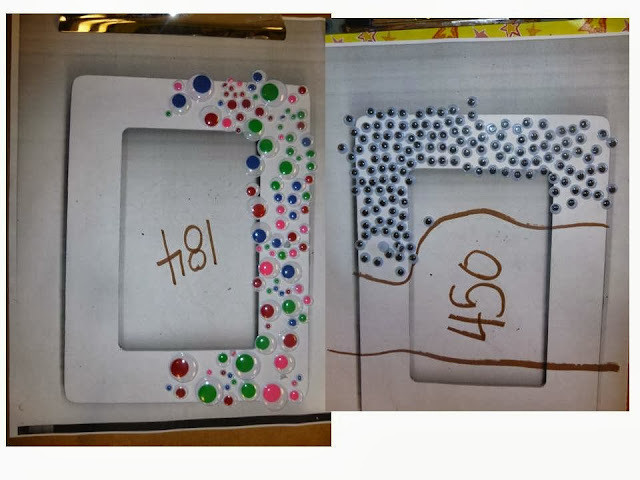 Some groups could not cover their entire frame and had to do some estimation. We put the googly eye covered frames under the document camera to present each group's solution. A few samples of student work. Displayed this under the document camera and saved on a shelf till Monday. We recorded the solutions and then looked for an average number. We had just been working on number lines last week so we made a number line and decided 200 would be in the middle of our numbers. Next they needed to figure out how many googly eyes that would be in total if each person needed about 200. Again some kiddos were stumped but we got there - 4000. A portion of our recording chart - how many pieces in a pkg. who used them, how many we needed to cover a frame using that package. We had to call it a day there. On Monday we will be continuing with this problem. They will need to decide how many packages I should buy in order to have 4000 googly eyes. They will be having fun making decisions, arguing with other groups and reaching a consensus for me so that I can go shopping. I will be looking to see how the talk to each other about their thinking and how they work with large numbers. 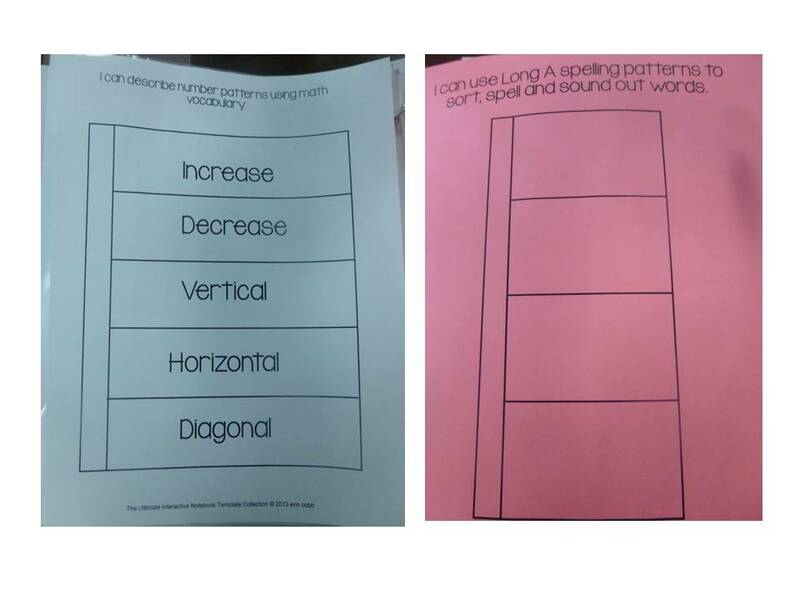 My advanced kiddos will need to come up with multiple solutions or use a variety of packages. I hope you can use this idea too. Be sure and check out other motivating ideas at her blog! 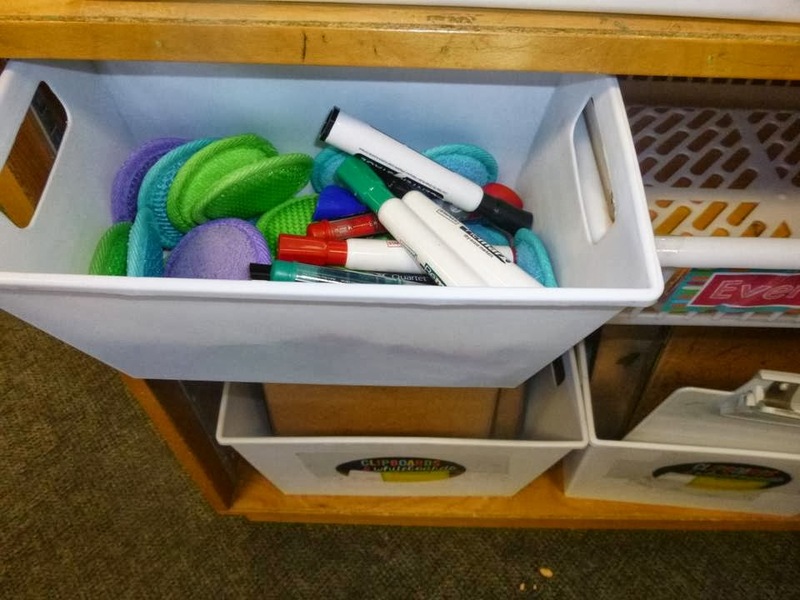 Today I just want to share a few organizational tricks that I have tried out this year that I have read about on other blogs or seen on Pinterest that are really working in my classroom. 1. Using face cleaning pads to clean off white boards/page protectors. 2. Page protected calendar math. Each student has a calendar math sheet - double sides that looks like this. It goes in a page protector and each morning we work on our number skills etc at the same time that some students are eating breakfast. 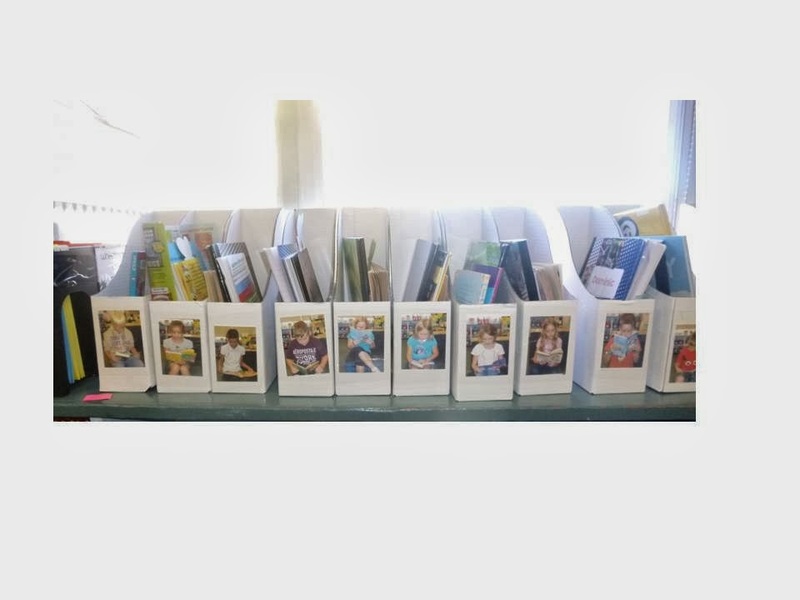 I got this idea from Tunstall's Teaching Tidbits and her amazing Rise and Shine Binders. I was very worried about this new breakfast program and the possibility of food spills and wasting paper on students who were eating and not completing the page but so far this is working out lovely! 3. Individual reading boxes. I got this idea from everyone!! I bought the magazine holders from Ikea and took pictures of my students reading for the labels - loving the boxes. 5. Group recycling baskets. I started using interactive notebooks this year and we produce a lot of paper that needs to be recycled. The getting up and recycling and paper on the floor was driving me a little bit bonkers. But I saw this idea every where online and had one of those - I am so stupid, why did I not think of that - moments. 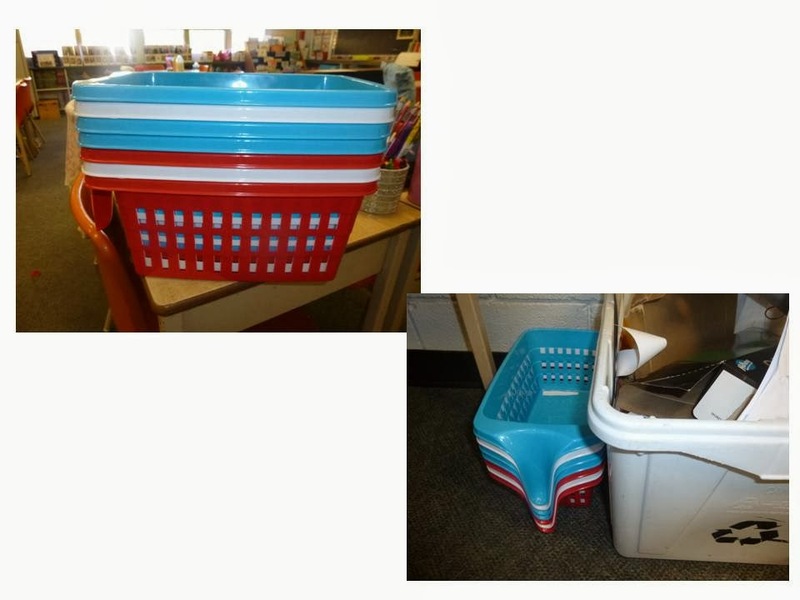 I put the baskets out in the middle of my groups when we are cutting out our awesome foldables and I Can statements :) and all of the extra paper pieces go in. No one is walking around and there is less (still some) paper on the floor. I do not have class jobs but a teacher of the day and this person is called on to dump them all or I usually have an early finisher and just a super sweet student empty them before I ask. That is it 5 little tips or tricks I have tried that are really working out well in my classroom this year. Be sure to stop by Holly's amazing blog to see what else people are trying!! Much has been written about war and remembrance, but very little of it has been for young children. As questions come from a young grandchild, his grandpa talks about how, as a very young man, he was as proud as a peacock in uniform, busy as a beaver on his Atlantic crossing, and brave as a lion charging into battle. Soon, the old man’s room is filled with an imaginary menagerie as the child thinks about different aspects of wartime. But as he pins medals on his grandpa’s blazer and receives his own red poppy in return, the mood becomes more somber. Outside, the crowd gathered for the veterans’ parade grows as quiet as a mouse, while men and women — old and young — march past in the rain. A trumpet plays and Grandpa lays a wreath in memory of his lost friend. Just then, the child imagines an elephant in the mist. “Elephants never forget,” he whispers to his grandpa. “Then let’s be elephants,” says the old man, as he wipes water from his eyes and takes his grandson’s hand. The text is simple - but the feelings and imagery make the book more complex and suitable for any grade. 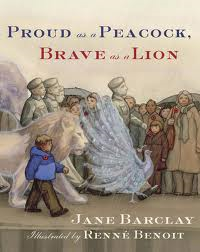 I hope to use this book this November to discuss Remembrance Day/Peace/Anti-Bullying and make our own simile posters/class book. As you can see I am still thinking it through - but it is definitely a book worth checking out. 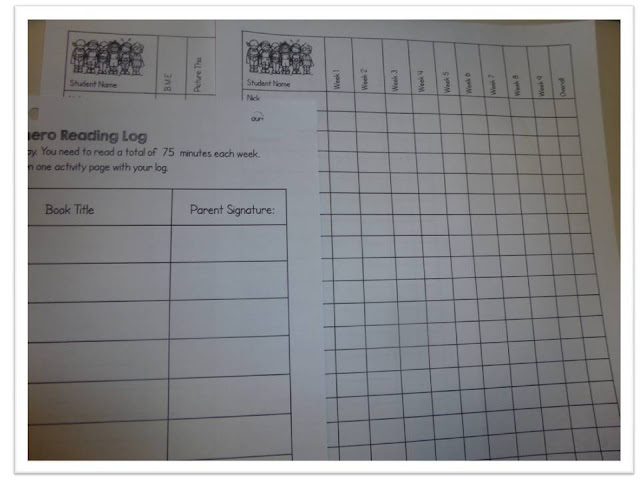 On Tuesday I posted about how I am trying home reading logs again this year (read about it here) and I know not everyone loves home reading logs but I think that it works for the parents and students that I teach. That being said, not all of the students are motivated to read at home so here are a few of the things that I am doing to try and build motivation into the program. 2. Talking to the parents at open house. All of the parents that I talked to were on board and I found last year, some of these same parents were not able to or did not have their kids reading at home. 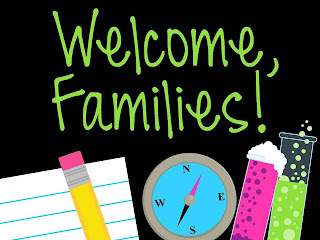 Some parents appreciate that we are both insisting on reading at home, the program gives them that little extra support at home to get their kids reading. 3. 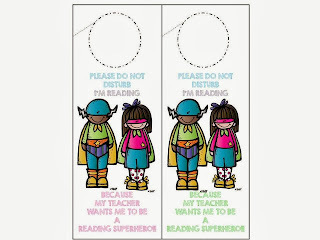 I sent home the door hangers - after stealing the idea from Joanne before we even got started to try and spark some motivation for reading at home. 4. 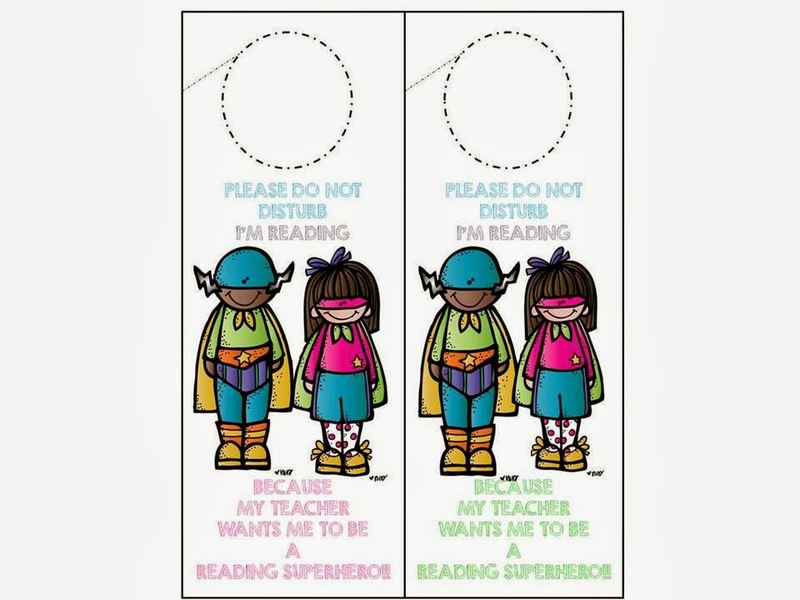 I made bookmarks for my students - this will be the prize for week 3. I personalized them with their names. 5. I have picked up a few prizes - my plan is to reward students every 3 weeks with a small prize. 6. After nine weeks of successful home reading students get to choose a book. I usually stock pile books through Scholastic in order to do this. 7. 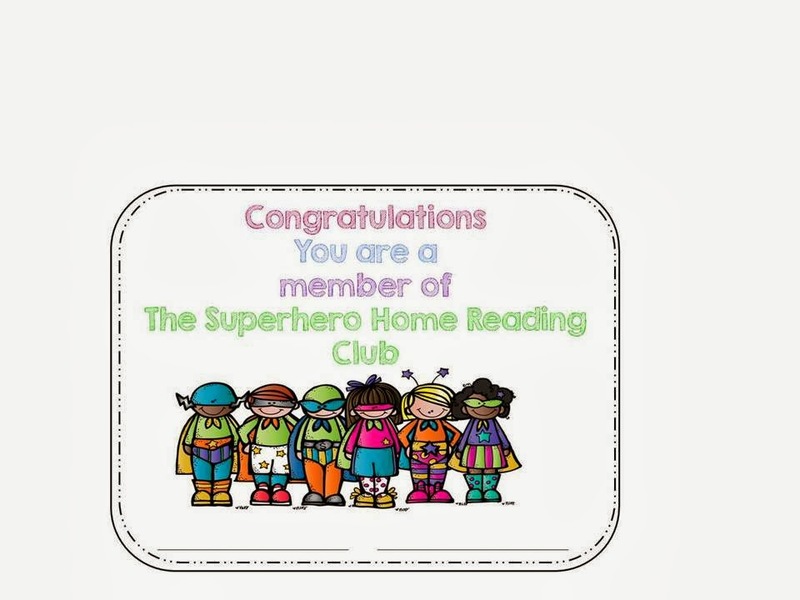 Certificates for completing so many weeks of home reading. 8. 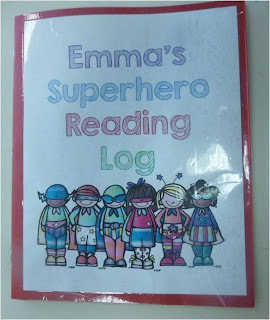 A sticker chart - which is still surprisingly motivating for students in grade 3/4 and this Superhero Reading Club sign. To make the sticker chart I just took my recording sheet, saved it as a PDF and printed it as a poster. 9. Negative consequences - students who are not reading at home will have an lunch reading club - time spent at their recess reading. I hope that as the year progresses and the students are reading regularly I can move the program to focus more on book talks and book recommendations but for right now I just need them to be reading! Today was a super long day. I have my BTS head cold and tonight was our Open House. No shaking hands and hugging former students for me! I have read The Book Whisperer (twice actually) and took a lot away from it. Last year I thought - home reading logs are pointless - I agreed with a lot of the points made in the book. 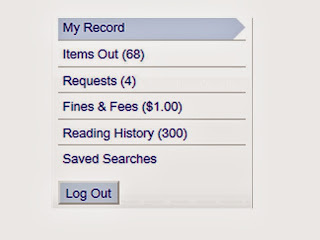 Unfortunately, without home reading logs most of my students DID NOT read at home. I had a few students that I would describe as voracious readers - the kind of student that reads at recess, on the bus, on the way to the bus and I had students who loved to read in class. But when I asked, the majority of my students were not reading at home - because they didn't have to. I know I should be able to instill in them a desire to read no matter what - but until then, I am making them read and making their parents sign!! 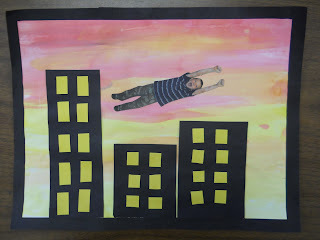 This year when I asked my students if their parents were readers four students raised their hands. That is 1/5 of the students! I am a reader so we were talking about the type of reading where people can't talk to you because even if you say you are listening, you are not - only two students have those types of parents. 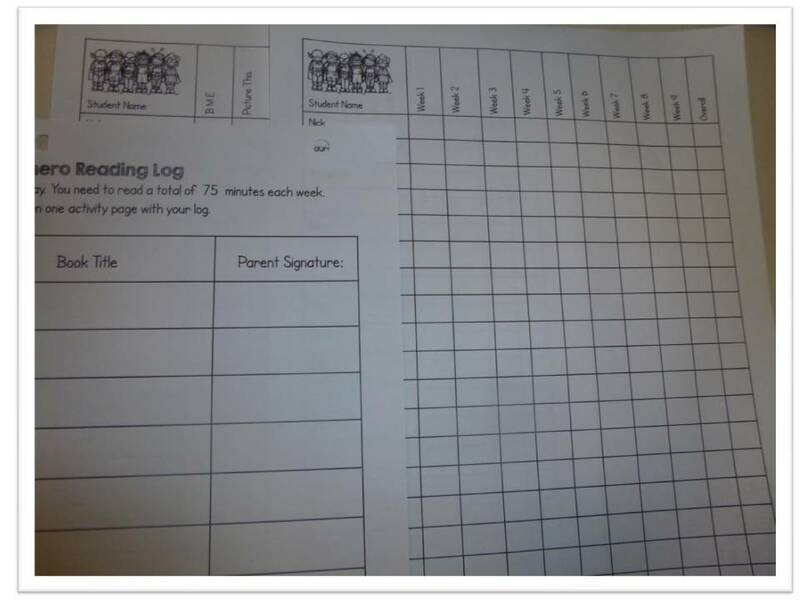 I think that when I don't assign reading with a home reading log - not only do the students think they don't have to read, the parents see it as an out as well. So this is what we are doing. 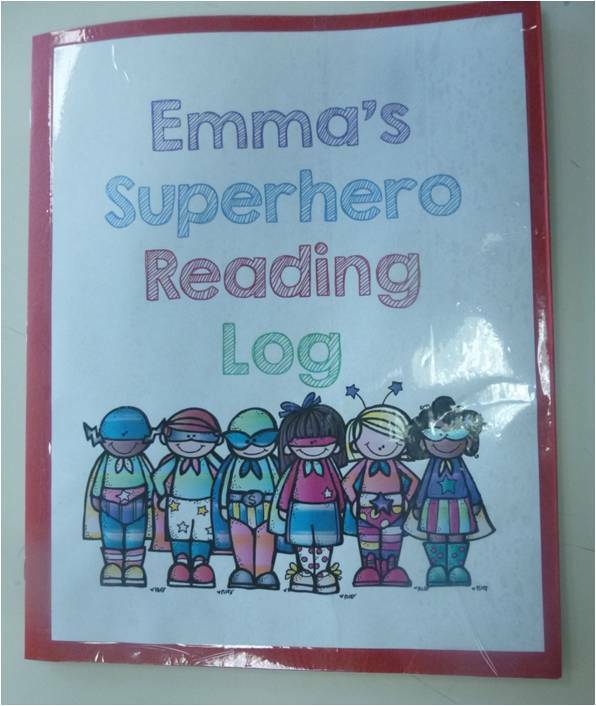 Each student is given a folder, inside is info for the parents, a weekly reading log and reading response pages. I am asking my students to read for 75 minutes a week (or 15 minutes 5x a week) and do one reading response page. 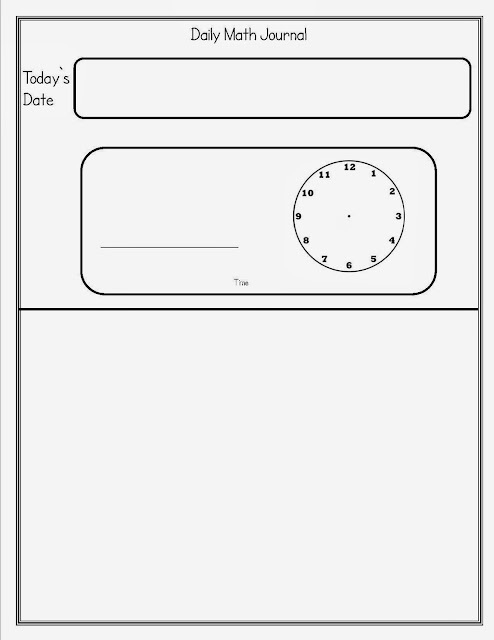 Students can select the reading response page they would like to complete for the week. They can choose books from the classroom or reading material at home. All I ask is they return their folder on Monday with their parent's signature. Of course the program has a superhero theme and some incentives (more on that on Saturday!). Inside the folder I put a letter to parents, a suggested reading list and a reading log. In the back pocket I put reading response pages. 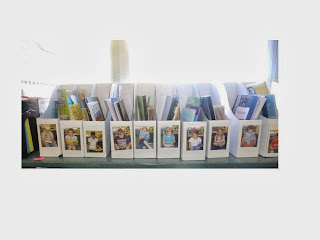 I also put in a large bookmark - this is for them to put in the place of a book if they borrow a book from our classroom library. This is where my students hand in their folders on Monday mornings. 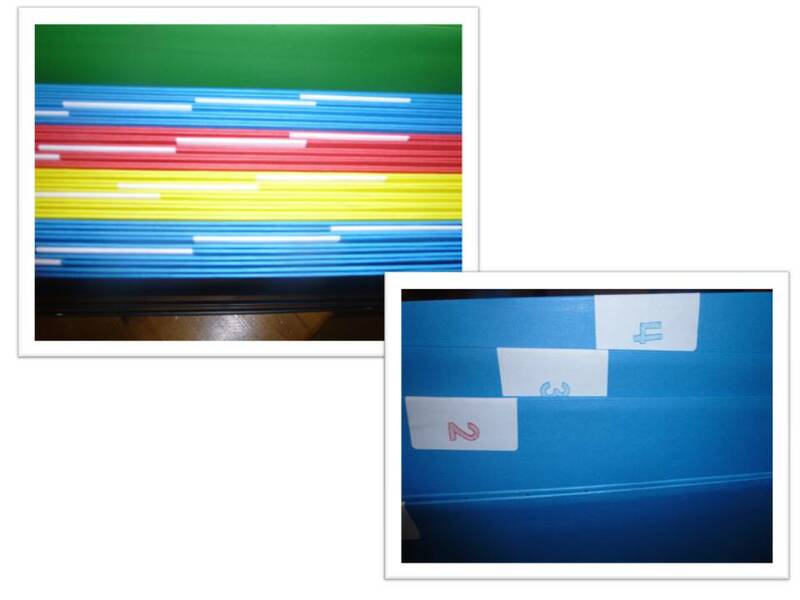 I have a label on each hanging file with their student numbers .The folders are grouped into 5 by color to make finding your file a little easier. Students find their number and put their home reading folder in! This makes it so much easier when I am checking to see who has returned their folder and completed their minutes. 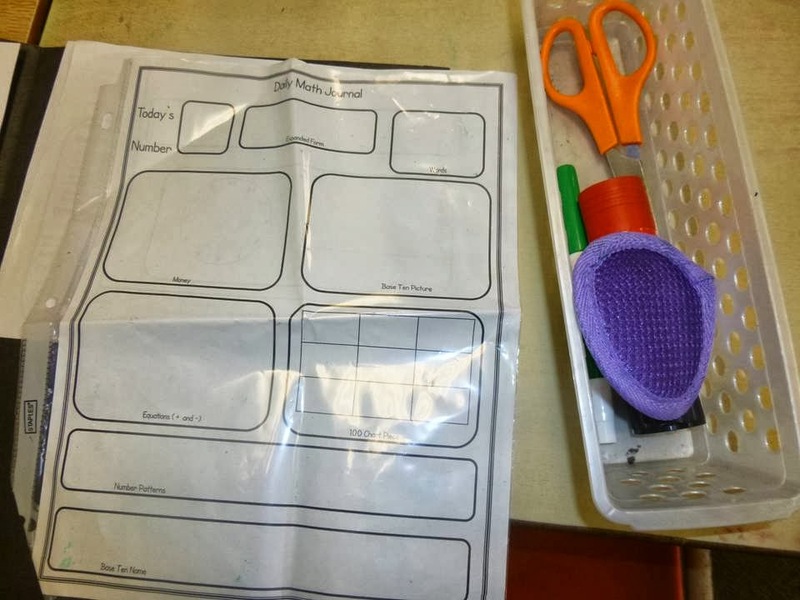 At the back of the file folders there is a green file folder - for new reading logs. 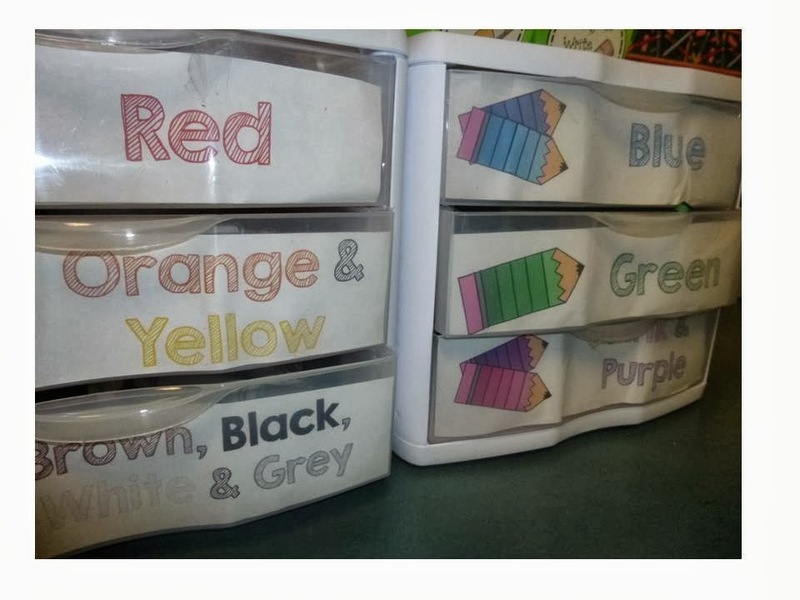 Next there is an orange file folder for extra reading response pages. I was able to quickly check the reading logs for time and parents signature. 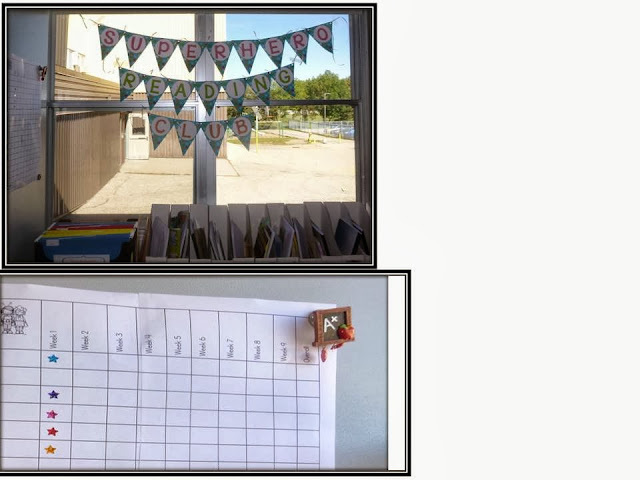 I have a recording sheet to see who has completed their minutes and another to track what response pages they have completed (since they select - did I mention that already? this head cold is kicking my behind). 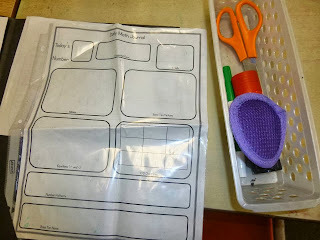 Today was our first day of returning our folders and about 70% of the class completed their home reading. We talked about it again, went over consequences and rewards and I hope that number goes up next week. 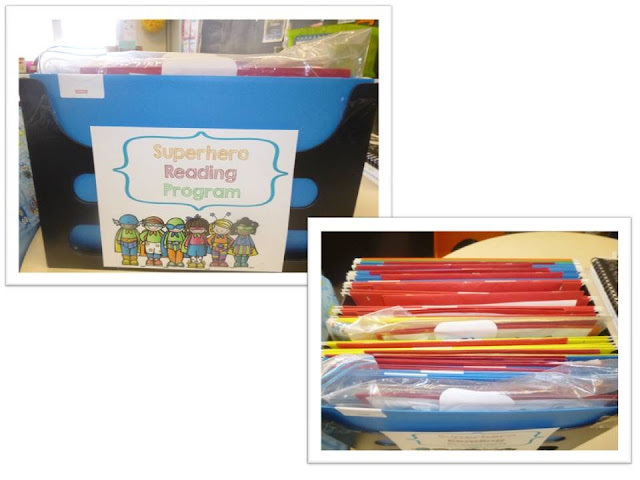 I will share with you some of my plans to motivate my students to read at home on Saturday!! 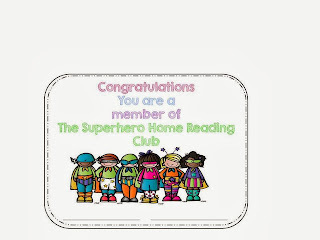 I would love to know if you do home reading and how it works in your classroom. 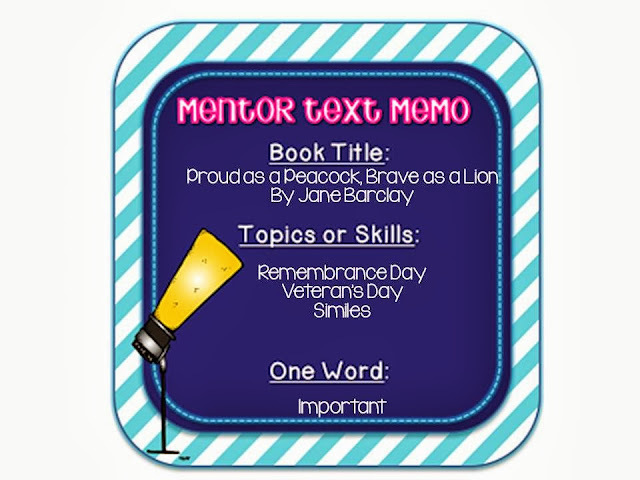 On Monday (and hopefully only Monday) we are going to finish up our All About Me books from Joanne at Head Over Heels for Teaching. I always forget how slow students work at the beginning of the year. It is so hard - because I want them done for our Open House Tuesday night but I also want them to do a good job, sigh. I will post pictures later in the week of some of their work - some of their responses - too cute. One little girl asked me what you call the food dish with noodles and sausage and broccoli and peppers and I had no clue, I ran into her mom and the dish has no name, my little student devastated - how can she fill it in!!! to make connections. 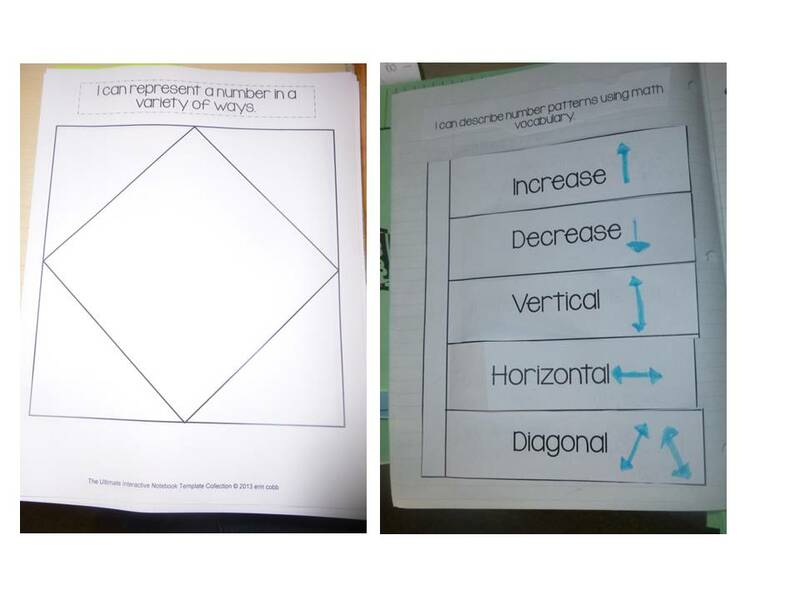 I will be using the making connections portion of Nicole Shelby's Interactive Notebook as the first entry in our Reading Notebooks. There are so many great ideas online for this book so we will be using it for the rest of the week for sure. 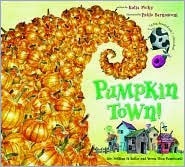 On Friday we will be using the book to explore the theme or message of the book before we do our bucket filling!! Thursday morning we have our first field trip. You know how sometimes you sign up for field trips at the end of the year for the following year and it seems like a really good idea at the time - yup, that is what I did and now I am going on a trip the second full week of school :). Throw in a little word study, place value math and social studies and there you have our week! I have purchased 3 interactive notebook products on TpT - but I haven't tried any of those yet (I am sure you will hear about them another Tuesday!). 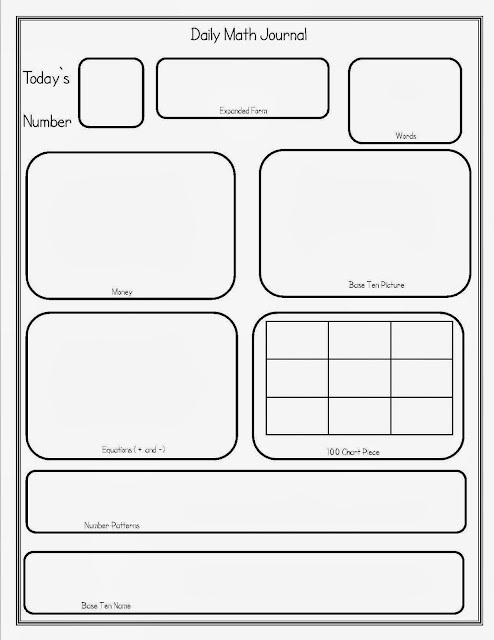 I also purchased Erin from I'm Lovin Lit's Ultimate Interactive Notebook Template Collection and I am loving it!!! There are many awesome features of this product so I will just highlight a few. #1. 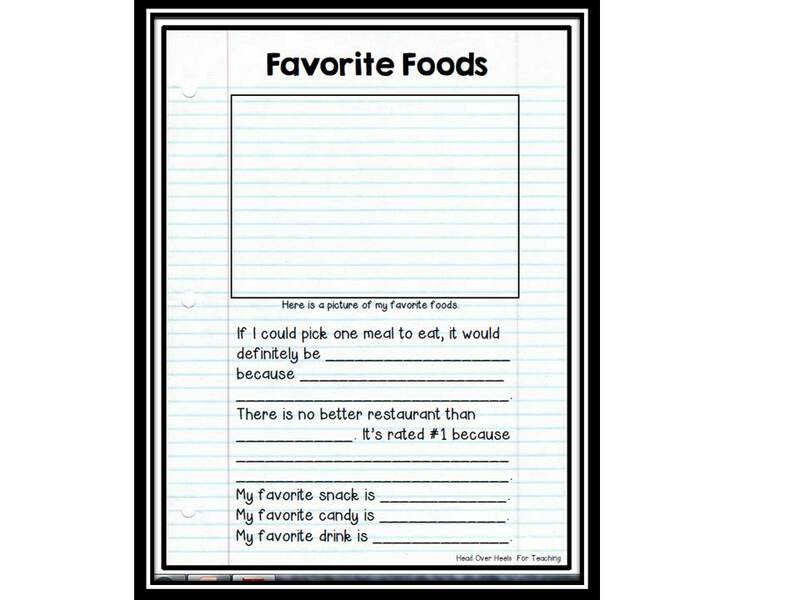 It is EDITABLE - that is right - I can add text and clipart and pictures and I Can statements right to the page!!! #2. 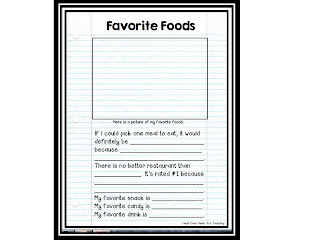 There are a gazillion templates to choose from - since I am new to this interactive notebook world I just scroll through the pictures and I always find something that will work for me (I have to admit some of them I am not sure how to use...yet!). #3. I can make a lesson more interactive in no time - when I am planning my lessons if I think of a way to include an interactive notebook component I can make one up super quick - where before I would have to play around in PPT sizing things and rearranging things. Since I am new to IN this makes me more likely to include this element to my lesson. So far the students are really enjoying the foldables we are making - they are pretty basic but we are just getting the basics down. Here are some samples of what we I have made so far and what the student sample looks like. What I don't love so far about Interactive Notebooks - is the amount of instructions I am giving out and the time it takes to cut and paste and the bits of paper! !